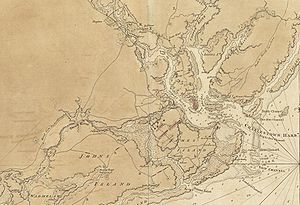 The Battle of Charleston was one of the major battles which took place towards the end of the American Revolutionary War, after the British began to shift their strategic focus towards the American Southern Colonies. After about six weeks of siege, Continental Army Major General Benjamin Lincoln surrendered forces numbering about 5,000 to the British. 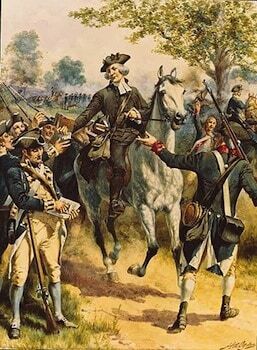 In late 1779, following strategic failures earlier in the war, the British were stymied by the waiting strategy adopted by General George Washington leading the Continental Army. Under political pressure to deliver victory, British leaders turned to launching their “southern strategy” for winning the war, that built on the idea that there was strong Loyalist sentiment supporting the southern colonies. 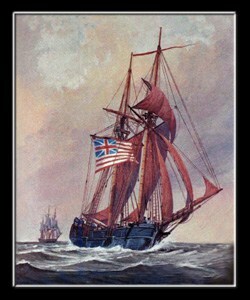 Their opening move was the Capture of Savannah, Georgia in December 1778. After repulsing a siege and assault on Savannah by a combined Franco-American force in October 1779, the British planned an attack on Charleston, South Carolina which they intended to use as a base for further operations in the north. The British government instructed Sir Henry Clinton to head a combined military and naval expedition southward. He evacuated Newport, Rhode Island, on October 25, 1779, and left New York City in command of Hessian General Wilhelm von Knyphausen. In December, he sailed with 8,500 troops to join Colonel Mark Prevost at Savannah. Charles Cornwallis accompanied him, and later Lord Rawdon joined him with an additional force, raising the size of the expedition to around 14,000 troops and 90 ships. Marching upon Charleston via James Island, Clinton cut off the city from relief, and began a siege on April 1. Skirmishes at Monck’s Corner and Lenud’s Ferry in April and early May scattered troops on the outskirts of the siege area. Benjamin Lincoln held a council of war, and was advised by de Laumoy to surrender given the inadequate fortifications. Clinton compelled Lincoln to surrender on May 12. The loss of the city and its 5,000 troops was a serious blow to the American cause. It was the largest surrender of an American armed force until the 1862 surrender of Union forces at Harper’s Ferry during the Antietam Campaign. The last remaining Continental Army troops were driven from South Carolina consequent to the May 29 Battle of Waxhaws. General Clinton returned to New York City in June, leaving Cornwallis in command with instructions to also reduce North Carolina. In his book A history of the campaigns of 1780 and 1781, Banastre Tarleton reported a total of 5,283 captured, including three signers of the Declaration of Independence: Edward Rutledge, Arthur Middleton and Thomas Heyward, Jr.
An active and bitter partisan war began. The British advance was marked by more than the usual destruction of war; the Loyalists rose to arms; the Patriot population regrouped around some of its militia commanders to harass the British and their Loyalist allies. Little mercy was shown on either side, especially after Tarleton’s decimation of the Continentals at the Battle of Waxhaws and Light Horse Harry Lee’s decimation of the Loyalists at Haw River, which many saw as massacres. Charleston remained under British control until they evacuated it in 1782 due to the imminent Treaty of Paris. Three current Army National Guard units (116th Inf, 263rd ADA and 131st MP Co are derived from American units that participated in the Siege of Charleston. There are only thirty Army National Guard and active Regular Army units with lineages that go back to the colonial era.